Is Cody Zeller in the Mix? 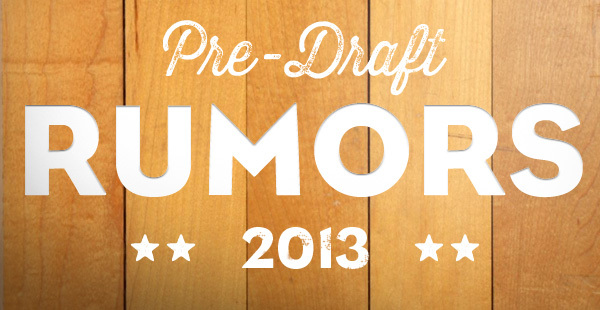 Cody Zeller’s name has been linked to the Bobcats over the past 48 hours as a sleeper pick at number four. Not really a surprise as Zeller grades very well statistically (remember Cho’s famed database?). ESPN’s Kevin Pelton posted a great Draft Comp piece yesterday that had Cody’s collegiate numbers near identical to Lamarcus Aldridge and Chris Bosh – and neither of those two had a defensive phenom like Bismack Biyombo to develop next two. Anthony Bennett Destined for Charlotte? Of course, this all might be a smokescreen to obfuscate the Charlotte’s actual target. Could it be Anthony Bennett? Victor Oladipo? Both of these players are projected in the Draft’s Top 3 but could also fall, especially if Cleveland passes on Nerlens Noel (Orlando would take him at two instead of Oladipo). Bennett and Oladipo can both be plugged into the starting five immediately and help. I’d put Otto Porter and maybe even Zeller in that category as well. Will Alex Len Slip to the Cats? Many mocks still have Charlotte staying put at four and taking Alex Len if Cleveland passes on the Maryland center at number one. Next year’s Draft lacks any top tier centers (at least for now) and Cho could elect to grab one while he has the chance. ESPN’s Fran Fraschilla – a guy who’s never been known for clickbait – projects Len as this year’s Jonas Valanciunas. That’s a big deal. If the Cats go with either Oladipo or Ben McLemore, everyone please send Gerald Henderson a nice thank you/farewell message on twitter. As a restricted free agent, the team will likely renounce Henderson’s rights as soon as free agency begins in July should they select a SG. Don’t worry Hendo fans, my gut feeling tells me that Charlotte will exit the Draft with either a PF or C and Gerald will be back next season. Trading back could be another option. We’ve known about the Minnesota “Derrick Williams, 9 and 26” proposal for a while. There could be other opportunities as well. If the team isn’t sold on any single prospect, then this might be the best option. UPDATE: Oklahoma City is another team that would like to move up and grab Len. They have the 12th pick and a few other nice prospects in Perry Jones, Jeremy Lamb and the Bobcats’ 2nd rounder (via the Byron Mullens trade). If Cho isn’t sold on any of the draft’s top talent, his old boss in OKC (Presti) might be the first call he makes. Will Rich Cho Want to Trade Up? Less likely could be a trade up scenario. Could an offer of Bismack Biyombo and the number four pick be enough to trade up to Cleveland’s 1st? If the team is sold on Noel and wants to tank another season in hopes of Andrew Wiggins, this might be their best bet. With the NBA draft just around the corner, this becomes the most important part of the year for the Bobcats. They have yet another top-five selection—the fifth in their ten-year history—and some key free agent decisions. Most notably former lottery pick Gerald Henderson. It’s impossible to deny that Henderson has been one of the most successful Bobcats draft picks to date. Which is to say, he’s not a total, unparalleled failure. Henderson came into the league as an elite athlete known for his defensive acumen. That much hasn’t changed in his four years in the Association, but since he’s been given solid playing time (a.k.a. when Larry Brown left), he’s scored at a very respectable clip, too. He hasn’t put up quite the scoring numbers Kemba Walker has (13.6 PPG vs. 15.2 PPG), but he closes that margin on a per-36 minute basis (16.0 vs. 17.4). Hendo’s been particularly good in catch-and-shoot plays coming off screens—he was sixth in mid-range shooting among shooting guards last year at 43.4%. But even though he’ll never be a 20 PPG scorer, and his numbers are surely inflated since Kemba Walker is the only other semi-reliable scorer on the team, he’s shown steady improvement each year in the league. From his freshman to his junior year at Duke, he improved his shooting line from .451/.320/.627 to .450/.336/.761, and he showed an even bigger improvement in his first four years in the pros (.356/.211/.745 to .447/.330/.824). For how little love Henderson gets, he puts up top-15 numbers among shooting guards across the board, making him an above-average starter. 10th in PER (16.48). 11th in scoring (15.5 PPG). 7th in field goal percentage (.447). 14th in free throw percentage (.824). 10th in offensive rebounding (0.8 ORPG). 12th in blocks (0.50 BPG). He doesn’t have a marquee name, and he isn’t (yet) an elite long-range shooter, but you sure could do worse at the 2-guard. Now, Henderson is a restricted free agent, and the upcoming NBA draft features two young shooting guards who may be available for Charlotte: Victor Oladipo and Ben McLemore. One who is very similar to Henderson and one who is completely different. First let’s take a look at Oladipo, who has a shockingly similar profile to Henderson. That’s two different ways of describing the same player. 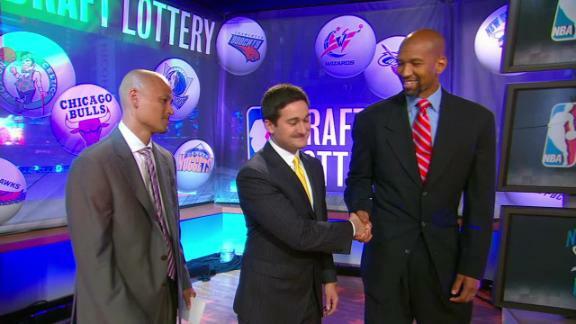 Why draft someone who resembles Gerald Henderson when you could have the actual Gerald Henderson and another player? There are obviously some differences between them that favor Oladipo (42” vs. 35” vertical and .441 vs. .336 junior year 3-point percentage, although their .338 and .329 3-point percentage throughout college makes it closer). But drafting the Hoosier just seems redundant when there are other players on the board. The good news (? ), though, is that Oladipo probably won’t be on the board when the Bobcats select fourth; Orlando reportedly has an eye on him with the second pick. Ben McLemore, on the other hand, is a completely different animal. His game is based on shooting instead of defensive intensity, something the Bobcats have been searching for ever since they traded Jason Richardson. McLemore’s redshirt freshman year was a mixed bag, since he shot 42% from beyond the arc and nearly joined the 50-40-90 club (.495/.420/.870) but also faded in the NCAA tournament and deferred to Elijah Johnson all year. He even had 11 20-point games, although he also had 12 games with 11 or less, including a 2-point performance in the Round of 32 against North Carolina. McLemore has the raw tools to be an All-Star and a solid defender, but he hasn’t shown the killer instinct of a superstar. Say what you want about intangibles, but McLemore does have one skill the Bobcats desperately need: shooting. In a vacuum, I like McLemore. But the cost of drafting McLemore isn’t just “missing out” on Anthony Bennett or Alex Len, it’s losing Gerald Henderson, too. Charlotte wouldn’t bring back Henderson after drafting McLemore because there simply aren’t enough minutes for the development of Walker, Ramon Sessions, McLemore, Henderson, Michael Kidd-Gilchrist, and Jeff Taylor. McLemore will probably be a good player, but will he be better than whomever else the Bobcats would draft and Henderson? I’m guessing that’s a no. Gerald Henderson will never be Kobe Bryant, but the Bobcats, according to the Charlotte Observer’s Rick Bonnell, understand his value. Three-and-D wings are becoming very important—look at Danny Green in these Finals—and Charlotte understands GH’s value more than any other team. Interestingly enough, Kemba’s scoring (18.3 vs. 17.8), shooting (43% vs. 41%), three-point shooting (37% vs. 32%), assists (6.0 vs. 5.7), and rebounding (3.7 vs. 3.4) all tick up when Henderson is on the floor. Henderson won’t cost as much as DeMar DeRozan’s leviathan 4-year $40 million deal—the Raptor was drafted three picks before Henderson in ‘09—he’ll be more in the $5-6 million range, a bit above his $4.3 million qualifying offer. The Bobcats have the right to match any offer another team gives, but it’s hard to imagine him getting an offer much higher than the mid-level exception. The market will likely dictate a four-year pact for about $22 million, although he’s probably worth even more than that. If the choice comes down to a rookie shooting guard (McLemore) or Henderson and a rookie big man (Bennett, Len, or even Noel), I’m taking the latter every time. 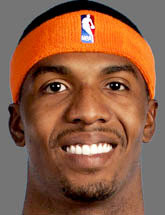 And if that doesn’t convince you, Henderson has my favorite nickname in the NBA: The OG (The Other Gerald). That has to count for something, right? 1. Full on tanking only works if you absolutely NAIL the Lottery. The easy part is when Kevin Durant falls into your lap. The challenge is in the mid-Lottery and late rounds, where you find and groom a Russell Westbrook or Serge Ibaka. Charlotte hasn’t done that. 2. Full on tanking without NAILING the Lottery = Toxic Reputation = Lost Opportunities. Think Brian Shaw would’ve been a better coach than Mike Dunlap? Think James Harden is a slightly better player than MKG? These two missed opportunities are the direct result of the team’s lowly reputation. Desirable free agents, scouts and executives aren’t going to risk their careers in a situation doomed for failure. “But we have to be bad to get good!! !” Eh, not exactly. Bottoming out for a year can sometimes work in a Duncan or Lebron Once-In-A-Generation Lottery but good organizations can find and develop guys like Roy Hibbert, Nicholas Batum, Paul Milsap and Ty Lawson late in the first round. “But we want to build a championship team, not a mediocre one!” Newsflash: Only eight franchises have hoisted a Larry O’Brien since 1984, averaging out to a “new” champion every 3.75 years. At this rate, the Queen City can plan on throwing a parade sometime after June 2095. In the meantime, the Bobcats/future Hornets should strive for the more modest goal of being consistently competitive. With name-brand free agents and coaches refusing to lower themselves to the Bobcats current level, maybe we should be saying “You have to be relevant to have a chance at being good” instead. Before I begin the shameless public rosterbating, let’s set the ground rules. 1. The 2013 NBA Draft is superstar-free. Like all drafts, there’s probably a couple of All-Stars tucked away but the mass consensus is that there is no instant franchise changer this year. 2. Big name free agents won’t sign with the Bobcats unless they SEVERELY OVERPAY them. The team will have up to $20m in cap space with little to no chance of signing anyone that matters. Again, if you’re a name free agent and the money was equal (or even slightly better) why on earth would you put yourself in a potentially miserable situation? So the Bobcats will enter the offseason with $20 million that nobody (of substance) wants and a Top 4 pick in a Draft with no superstars. How in the heck are they supposed to improve? With the worst record in the league, the Cats are guaranteed to pick in the Top 4. The good news is that there are a few potential All-Stars (Marcus Smart, Ben McLemore, Nerlens Noel) and a few good starters (Otto Porter, Alex Len, Victor Oladipo), all guaranteed to be there when Charlotte picks. The bad news is that players like Porter and Noel basically duplicate what Charlotte already has in MKG/Biyombo so the organization better pray they score in the top two. For Rosterpalooza 1.0, we’re going to assume they pick 1 or 2. The Case for Marcus Smart. At one end of the Draft’s risk spectrum sits Noel, a seven footer with no real basketball skills coming off a major knee injury; at the other end a 6’4″, 225 pound, 19 year old point guard/artillery vehicle: Marcus Smart combines Russell Westbrook’s intensity and explosion with James Harden’s strength and handle, he has the potential to be an All-world combo guard in a league that caters to All-world combo guards. Like Westbrook coming out of UCLA, Smart’s shooting and court vision need work – which you can teach. What you CAN’T teach is Smart’s aggressiveness and size. He’ll figure the rest out. You can play him alongside Kemba Walker at the beginning and eventually transition Kemba to his perfect role of 3rd guard/6th man/Closer once Smart gets comfortable running the team. Boom. That’s a hell of a one-two punch. The Case for Ben McLemore. Imagine Ben Gordon if he were 6’5″, incredibly long and a plus defender. That’s Ben McLemore. He’s not going to put the ball on the floor and create but as a catch and shoot Ray Allen type, McLemore will open up driving lanes for Kemba and MKG, bust zones and double teams and roll off screens for set plays. AKA: all things Charlotte desperately needs. VERDICT: McLemore’s elite skill (shooting) make him the slightly safer pick and yes, the Bobcats certainly could use some floor spacers but consider this: spot-up shooting is relatively cheap and fairly abundant – skip down to the free agent shooters list below to have a look – you don’t need to spend the 1st or 2nd overall pick in the draft on it. Most of all, Marcus Smart’s size and position could be franchise-defining. He could legitmately be the Westbrook of the Eastern Conference. You can’t pass up that opportunity. If he’s on the board, pick Marcus Smart. 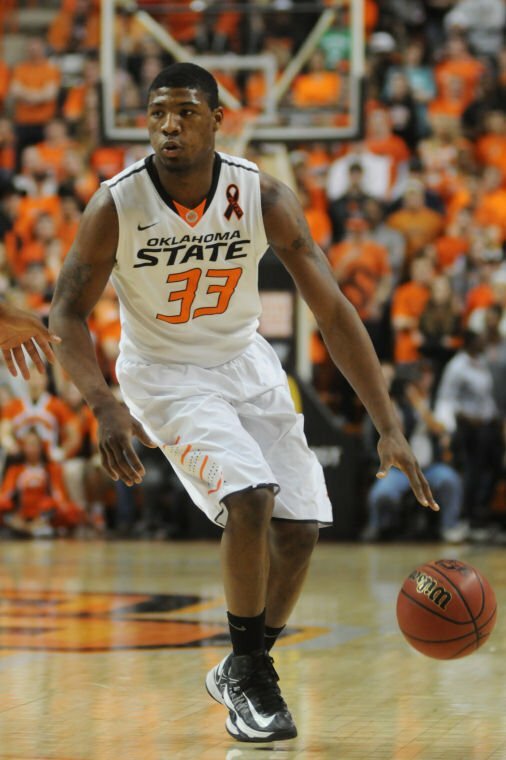 RESULT: Charlotte drafts Marcus Smart, G Oklahoma State. Like Thomas himself, this move is a no brainer – and also a litmus test. If the Cats don’t amnesty T-Time, we know that Michael Jordan isn’t serious about the team – which would work out just fine for us, we can all check out and follow the Heat, Celtics or Lakers like most NBA fans in Charlotte. That said, I fully expect Tyrus to be gone at the soonest possible moment. And to that I say, good riddance. 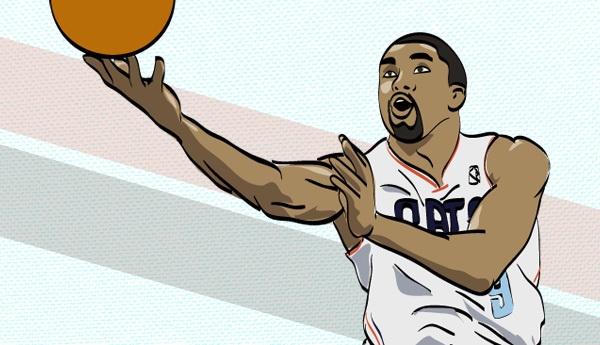 Trade Ben Gordon to Chicago for Carlos Boozer (and a little something extra). B. Boozer’s skill set and position are exactly what Charlotte needs: rebounding and post scoring. Think of it this way, would you rather pay Al Jefferson $60 million over 4 years AND pay Gordon $13 million next season OR only pay Boozer $30 million over two? Not to mention that Boozer’s contract expires the very same July the Cats will need to re-sign Walker. Did I mention Boozer instantly becomes the best Power Forward in Bobcats history? RESULT: Charlotte acquires PF Carlos Boozer via trade. 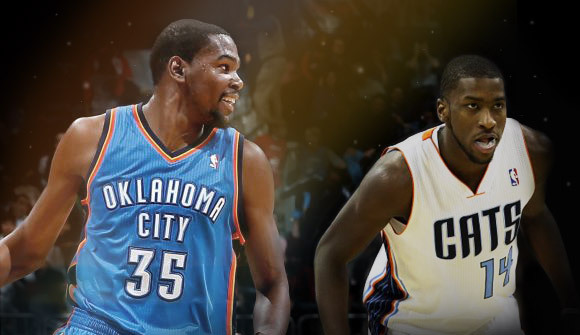 Trade Portland’s First Round Pick to OKC for Kendrick Perkins and Jeremy Lamb. 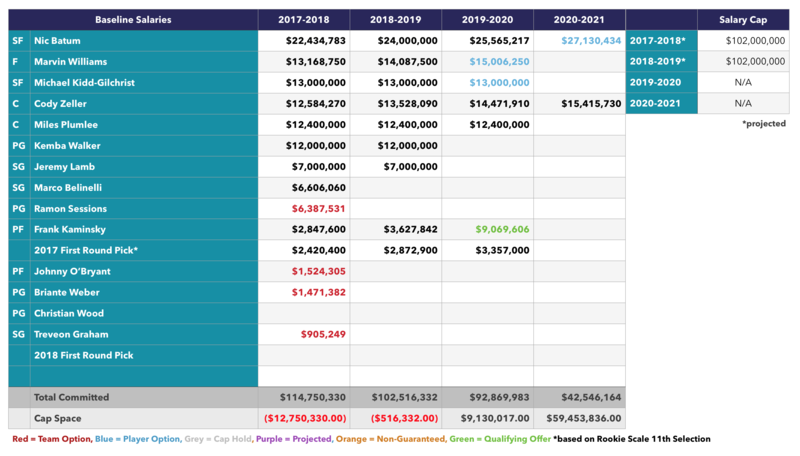 Perkins is a one-dimensional player overpaid by at least 40% and with the Thunder approaching the tax line, his final two years, $17.5 million will need to go. 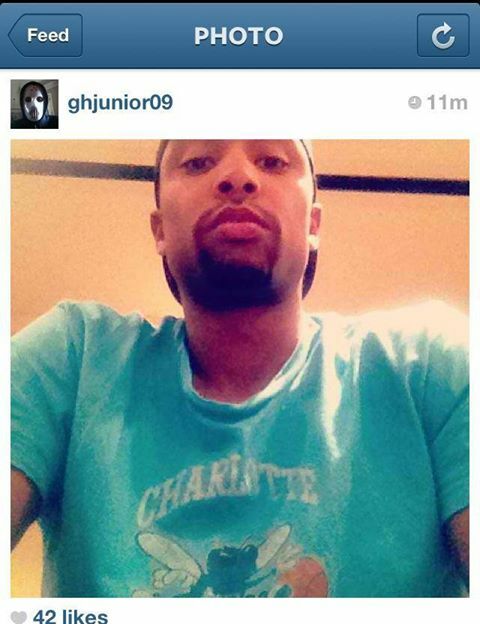 So why are the Bobcats giving up a first round pick to take him on? One of the many photos of Kendrick Perkins squeezing a basketball really hard. For one, Perk would help bring some real interior defense (as opposed to “defensive potential” defense) to a team that desperately needs to get better on that side of the ball. Again, his contract is perfectly timed with Bismack Biyombo’s extension so the team could make their decision after Biz learns a thing or two apprenticing under Kendrick (first lesson: “defense” is more than just trying to block every shot). But the real prize here is Lamb. Charlotte gets a Ben McLemore without having to draft one. Long and rangy, Kemba’s former UCONN teammate, has vast defensive potential and can score off the dribble or in the mid-range game. Acquiring Lamb would allow Charlotte to let Gerald Henderson walk, replacing Hendo at around 1/6th the cost. It’s a deal that nets the team two quality starters and all they have to give up is a mid-round pick and cap space nobody wants. Win-win. RESULT: Charlotte acquires C Kendrick Perkins, SG Jeremy Lamb via trade. Free Agent Gunners Available this Summer: Kevin Martin, JR Smith, Rip Hamilton, Kyle Korver, Anthony Morrow, Nick Young, Carlos Delfino, Martell Webster and… RAY ALLEN HIMSELF! Who needs “the next Ray Allen” when you can get the original at a discount. THIS IS ANOTHER REASON WHY YOU DON’T DRAFT BEN MCLEMORE! Why not sign this guy? All these guys can absolutely light it up from beyond the arc, all will be available in July and a few will come dirt cheap. 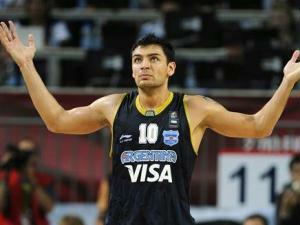 Of the bargain gunners, I like Delfino. He’s 31 and probably has another season or two of quality game left. Carlos gives the team another ball handler who can play either wing positions and is an underrated defender who can absolutely stroke the 3-ball when he gets hot. He signed a one year $3 million deal with Houston last July, so another one year, $3.75 million overpay from Charlotte will probably get it done. RESULT: Charlotte signs G/SF Carlos Delfino. Byron Mullens or Josh McRoberts? Do we even need to have this conversation? Josh McRoberts has been a perfect fit since his arrival. His abilities as a ball handler, floor spacer and playmaker have vaulted the former Dukie from the end of Orlando’s bench to Charlotte’s starting five. Two years, $7m should do the trick and you could even go three if the team was sold on him as their Nick Collison – Josh is amazingly only 26 years old. RESULT: Charlotte re-signs PF/C Josh McRoberts. In July of 2015, Charlotte could have up to $30 million in cap room. Some of the money will go towards re-signing Kemba but the team will have enough prospects and wins under their belt to lure the big name, max-players that they can’t today. + An incredible young backcourt of potential All-Stars Walker and Smart, a veteran playmaker in Sessions and a major prospect in Lamb. + Gerald Wallace 2.0 (MKG) improving at the 3 spot with a change of pace ballhandler/shooter in Delfino to back him up. + A real deal post presence slash double-double guy in Boozer with McRoberts as a solid backup at Power Forward. + One of the league’s elite defensive centers (Perkins) mentoring a still young defensive prospect (Biyombo) with Haywood staying on as an emergency big. + Better protection on their 1st round pick owed to Chicago should Charlotte not make the Playoffs and a likely Lottery selection from Detroit still owed to them. They can use either of these picks on a young big to eventually replace Boozer/Perkins. I don’t know the specifics of Mike Dunlap’s contract but it’s doubtful someone at his experience level has any guaranteed money in year two. 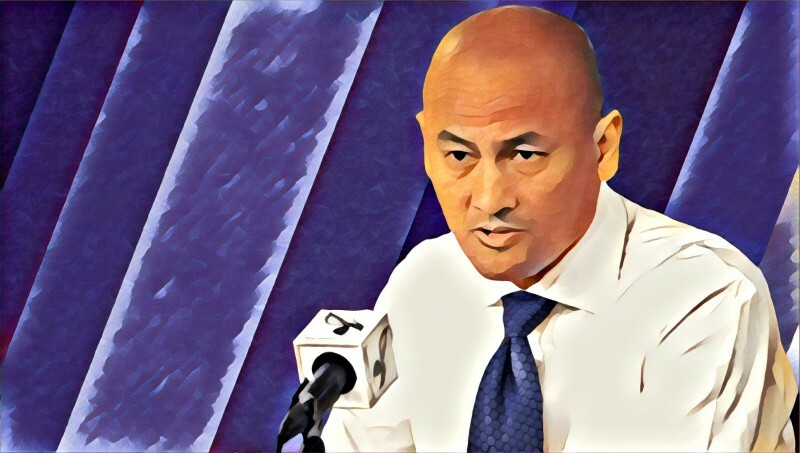 Dunlap has done his best and is obviously someone who works hard and loves the game but this franchise must decide if he’s the leader this young squad needs or if the job is better left to a veteran coach like Jerry Sloan, Mike Brown, Nate McMillan or Stan Van Gundy: All of whom may find this much-improved Bobcats roster to be surprisingly enticing.